Home Beers Joseph James Brewing Inc. 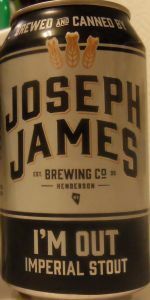 I'm Out Imperial Stout | Joseph James Brewing Inc. Poured into a Trillium glass a pretty nice dark brown color, pretty nice carbonation, with a pretty nice thick/creamy one-finger tan head, nice oil slick, and also some pretty nice sticky lacing behind. The nose is malty, with some nice chocolate/toffee, and coffee, some vanilla, licorice. The taste is pretty nice, malty, with a nice touch of chocolate/toffee, coffee, vanilla, slight licorice, nice sweetness. Medium body, ABV is hidden very nicely, a nice little complex brew. Overall, pretty tasty, surprise me. From: Liquor Outlet in Henderson, Nev. Fantastic dessert beer! On top of the world. Poured from can into tulip. A- Pour super dark, almost like motor oil, with two finger brown head. S- Up front I get a Smoky, almost like hint of tobacco, chocolate, espresso coffee. T- It follows the nose with a smoky taste. You get more tobacco than on the smell. I'm not a smoker, so tasting tobacco was a bit weird for me. You get a hint of chocolate, espresso and caramel. The bitterness hits at the end, but it's not strong. Alcohol is well hidden. M- It's medium bodied, with light carbonation. It's a bit smooth. O- I think it's the best stout I've tried from a brewery in Nevada. The tobacco smell and taste were a little bit off putting at the beginning, but I was able to easily get over that. Anyway, I recommend people to try it. I'm Out Imperial Stout from Joseph James Brewing Inc.